The concept of reflexology can be traced back to ancient Egyptian and Chinese civilizations. It was popularized in the United States in the early 1900s when various doctors and physiotherapists began to study the extent of nerve cells in the hands and feet. Reflexology is a safe and completely natural way for you to enhance the quality of your life. It uses massage therapy techniques to stimulate nerves, mostly in the palm of your hand and bottom of your foot. Each of these nerves branches off to different organs and glands in your body. There are a surprising amount of ways reflexology can help you live a healthier and happier life. It can help alleviate headaches, cold symptoms, stress, and many other daily inconveniences (more detailed listing below) all through a simple massage. For optimal results in reflexology you have to find out which nerves need stimulating. You do this by matching your ailment up with the right zones on your hands and feet. Once you’ve found the corresponding zone you can either have someone else apply pressure or simply do it yourself. The pressure is spread among the many nerve endings, there are more than 7000 on one foot alone, and opens up pathways of energy that may have been congested. Oils and lotion can be used for sensational value but are said to interfere with the direct nerve stimulation. What is Reflexology Best For? If you are intimidated by the mystery looming over modern medical techniques, you may find comfort in the simplistic safety reflexology has to offer. The overall relaxation and peace of mind is the most common application of reflexology and usually the first reason anybody tries it. 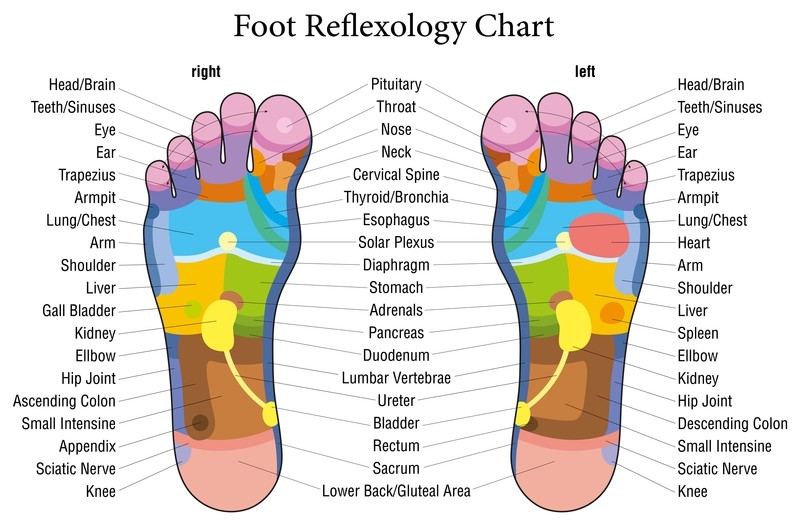 There are however many more significant ailments that reflexology can target and relieve. Different types of muscle pain – neck, shoulders, back, legs, etc… – can be targeted with the use of this therapy. If you have sore muscles, just find the nerve section that corresponds with the affected area. Reflexology can also help reproductive matters, digestion problems, stress and anxiety, sleep disorders, and a generally awesome relaxant. There are many certified reflexologists out there but the methods can be taught and easily done at home. Because there are so many different nerve zones on your hands and feet it helps to have diagrams handy to determine the correct areas. Here are a few common ailments and their corresponding nerve zones. For headaches you’ll focus mainly on nerve zones on the foot. Begin with circular rubbing on the big toes to relax your neck a bit. Then focus with more pressure on the upper halves of each toe to pinpoint nerves connecting to the head. You can also massage the upper halves of your fingers on both sides. You can also read my other article on how to relieve headache using essential oils. Targeting the pituitary gland is the ideal method of alleviating sleep disorders. In the direct middle of your fingerprint you’ll find the nerve linking your endocrine system. Apply direct pressure with the side of your nail. On the foot you should target the middle of your big toe on the bottom side. You can also read my other post to discover the best foods to get better sleep. For anxiety a stress you can start with the neck and head areas in the toes. Another technique called the wrist twist requires you to form a circle around your wrist with your thumb and index finger and twist the opposing hand back and forth about twenty times. In addition to reflexology you can also use 14 effective natural remedies for stress and anxiety. For colds and the flu you can pinpoint the areas that correspond with your sinuses, nose, throat, and lungs. On the feet you should concentrate on the side of your big toe, the middle of each toe, and an inch below your toes. On the hands massage from the tip of your finger to just above the knuckle and back up again. I also wrote a post about top 10 natural treatments for cold and flu. One of the most popular methods for digestion relief requires a small sphere like a golf ball or tennis ball. Lock your fingers together with the ball inside and rub it around the bottom of your palm for around 60 seconds. You can also gently rub the lower third of your foot on the bottom side. To improve your digestion you can also try to use my digestive enzyme detox smoothie. This ailment requires you to target the nerve zones associated with the lungs. On the top of your foot massage the width of your foot about an inch below the toes. On the bottom focus on the middle of the foot an inch below the toes. 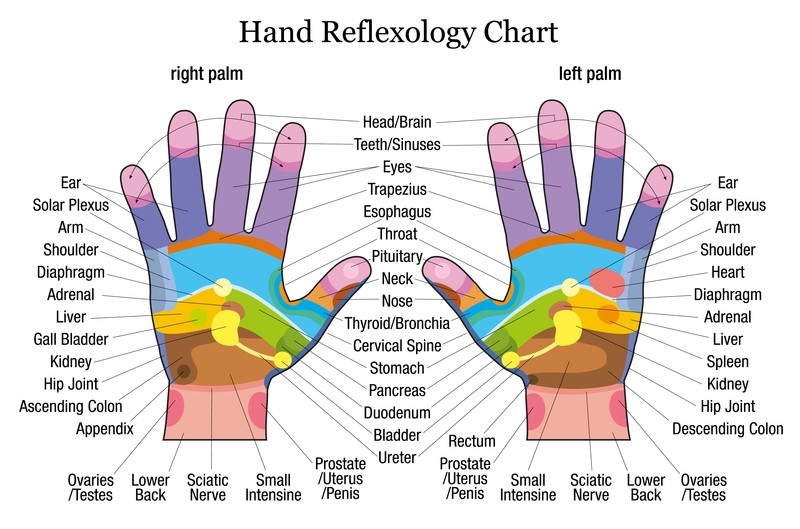 On your hands, massage just below the knuckles on top and where your palm meets the fingers on the bottom. There are other natural treatments for asthma. When you target the spine reflexes you can quickly alleviate the terror of back pains. On the hands you should focus on the side of the thumb to the bottom of your wrist. Rub the bottom half of your foot on the bottom and the width where your leg meets the foot on top. If you want to prevent back pain you can also use my recommended 13 exercises to strengthen your back. ● Search the web and check with the ARCB to find a certified reflexologist for your first session. They can show you exactly how to apply pressure and how long you should do it for great results. ● Find someone to help. If you don’t have to be the one applying pressure then you can focus more on relaxing and opening the clogged gateways. ● For the best results try reflexology several times throughout the day. It may not magically work the first time but it will gradually work its magic. Doing reflexology is also one of the 70 habits featured in my e-book 70 Powerful Habits For Great Health which will guide you how to take positive steps to improve your wellness and overall health.